The Jungle Cruise is an iconic Disney attraction that promises danger, adventure, and a whole lot of laughs! Located in Adventureland at both Disneyland and Disney World, the Jungle Cruise was an opening day attraction at both parks and is still entertaining guests today with its witty Jungle Cruise Skippers, the backside of water, and the hilarious names for its steamboats, such as Senegal Sal and Congo Connie. But did you know that the original idea for the Jungle Cruise was very different than the attraction we know today? Did you also know that evidence for the original plan for the Jungle Cruise can be found in two other Disney World parks? Get your pencil and paper ready because for today’s lesson, we are going to brush up on some Disney History: The Jungle Cruise! When Disneyland was being built in the 1950s, Walt wanted to create an attraction that represented his True-Life Adventures series. 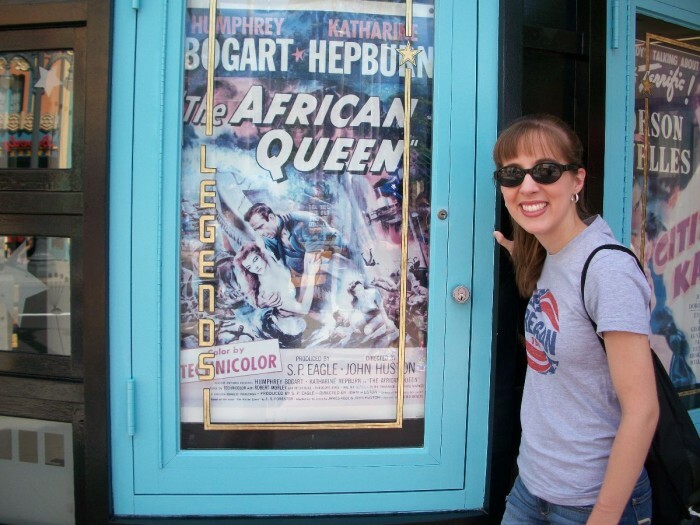 It’s also been said that Walt was a fan of The African Queen, a 1951 film starring Katharine Hepburn and Humphrey Bogart, a mismatched pair who must sail a steamboat down the rivers of Africa. The two ideas morphed into a vision for an attraction where guests would sail down the exotic rivers of the world in a steamboat while observing live wildlife on either side. Naturally, this plan had to be modified when Disney learned that live animals would be difficult to contain, care for, and keep to script, so the solution was to install audio-animatronic animals instead. However, you can find a vintage poster for The African Queen at Hollywood Studios on Sunset Boulevard as it is a Hollywood classic, but also possibly a nod to Walt’s inspiration for the Jungle Cruise! It’s hard to believe that the Jungle Cruise in its early Disneyland days was somewhat different than the Jungle Cruise of today and the one at Disney World. In fact, many of the trademark, amusing scenes from the attraction weren’t even there on opening day, but were later added by Imagineer Marc Davis. This is also true of the attraction’s original script. Originally, it was much more serious. The loveable, corny jokes we all love to quote were adopted and implemented later. When it was time to build Disney World in Florida, Imagineers were ready to install a more expounded version of the Jungle Cruise in the new Magic Kingdom. This time around, the light-hearted tone was already in place for this sister Jungle Cruise, but there were a few changes on the agenda. For one, Imagineers added the float through the dark temple, and Marc Davis added even more humorous scenes to delight and entertain! In 1998, Disney unveiled the new Animal Kingdom park; and the attraction that was getting the most attention was Kilimanjaro Safaris. This attraction was, and is, about as close to a real African safari as you can get and is the biggest Disney has ever created! Guests board a safari vehicle in the fictional village of Harambe at Animal Kingdom park’s Africa. They then travel through a very realistic looking reserve where live African wildlife roam freely! It’s an experience like no other, and way better than the zoo; but if you know about the original plan for the Jungle Cruise, you know that this was not a new idea. The Kilimanjaro Safaris of today was Walt’s vision for his original Adventureland attraction, just slightly altered for Animal Kingdom and minus the water and steamboat. Kilimanjaro Safaris is evidence that Walt truly was ahead of his time and that his ideas still have the power to create magic for today’s guests. 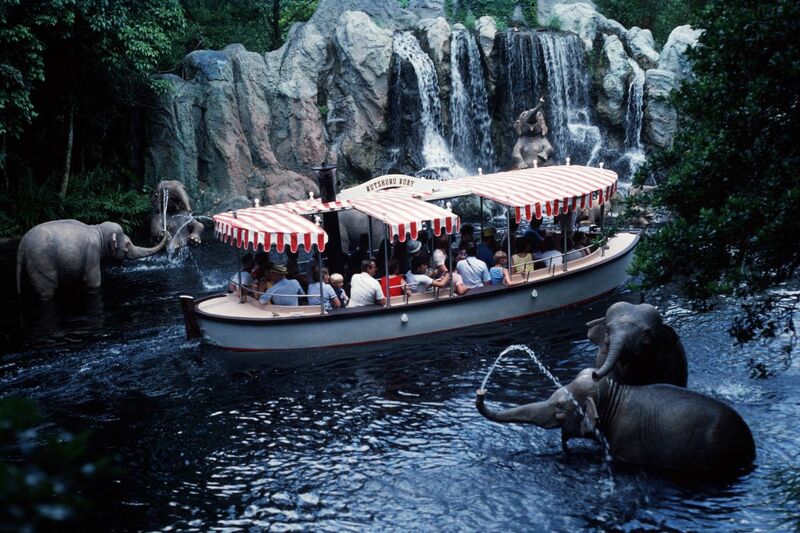 The Jungle Cruise is a Magic Kingdom staple, just like Dumbo the Flying Elephant and Pirates of the Caribbean. It’s also an essential part of the culture of Disney and recently, Disney has come up with ways to let you bring a little piece of the attraction home with you. This summer, the Marketplace Co-Op opened at Disney World’s Downtown Disney offering a selection of products themed after the Jungle Cruise. 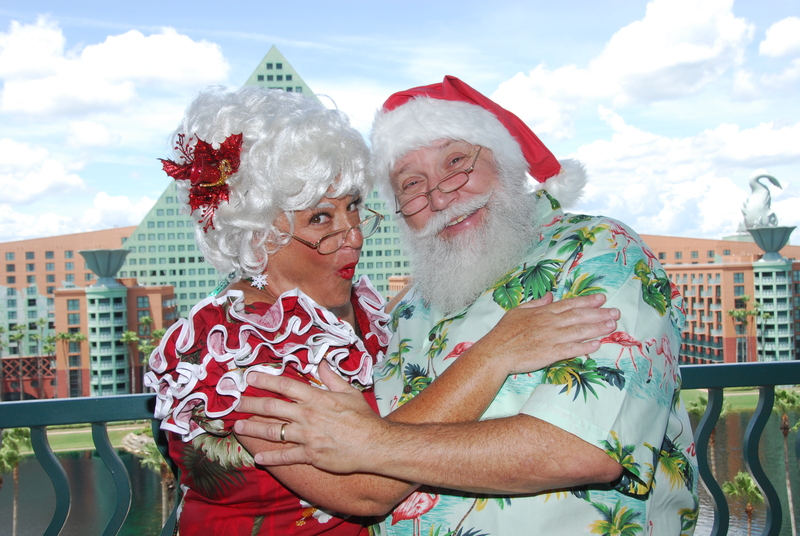 Also, the Jungle Cruise has continued to evolve to delight and surprise even Disney veterans, such as with its new Christmastime overlay known as the Jingle Cruise. 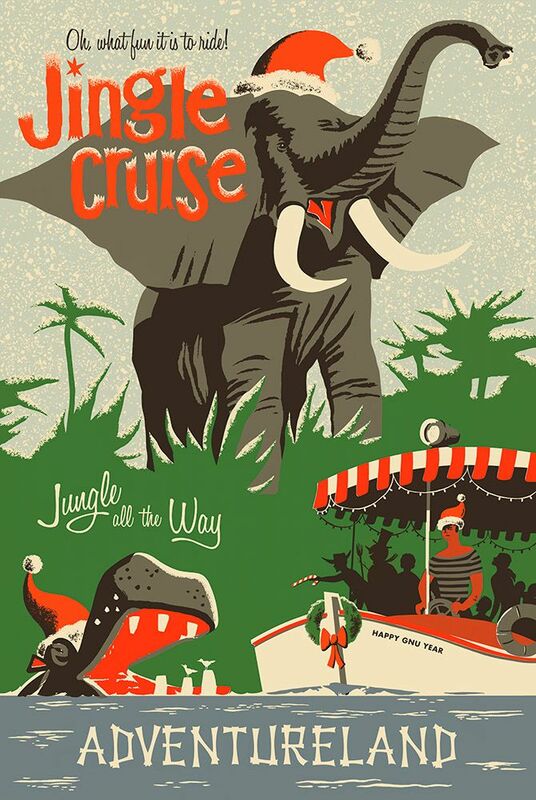 Fort the Christmas season, the Jungle Cruise’s famous script has been rewritten to include some holiday puns and it looks as if the skippers have done some decorating too! Now class, if you’ve been paying attention, you now know about the history of the Jungle Cruise and how the attraction has managed to adapt to the times, but also still connect us to the days of Disney past. Hopefully, this new knowledge will endear you to this Adventureland classic even more! Loved this post! Please do more about park history. Thanks for the great read. I know I will get slammed for this, but I think this ride should be replaced at WDW. We have live animals ay Animal Kingdom, why do we need fake ones. 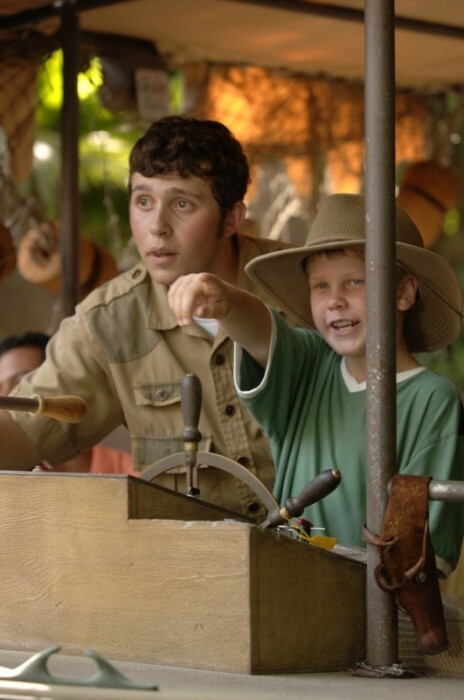 There should be a new adventure in Adventureland! Fun post – would also love to read more depth on the history of the ride!